This recipe is so fabulous it's hard to stop eating it. This is true comfort food. The combination of five kinds of cheese, heavy cream, onion, garlic, and tender cooked pasta is simply wonderful. The addition of bread crumbs mixed with butter on top adds the perfect final crunchy topping. You'll love every bite. Preheat the oven to 400 F and butter a 13" x 9" baking dish. Bring a large pot of water to boil for the pasta. Bring the chicken broth to a boil in a medium saucepan and reduce to 3/4 cup over high heat. Bring the cream to a boil in another large heavy saucepan and reduce it to 1-1/2 cups. Both of these processes should take about 10 minutes. Melt the butter and olive oil in another large heavy saucepan and cook the onions and garlic until translucent and tender. Cook the pasta until al dente and drain. Add the reduced cream and reduced broth to the onions, then add the mustard, cheddar, Gouda, Gruyere, and Brie cheeses and whisk until melted and blended. Add the seasonings. Add the pasta and mix well. Spoon into the prepared baking dish. 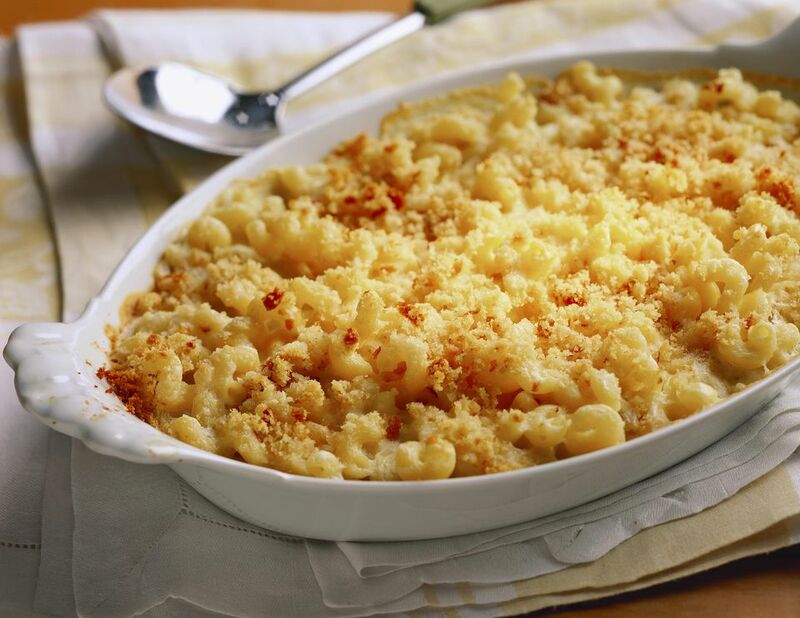 In a small bowl, mix bread crumbs, 3 tablespoons melted butter and Parmesan cheese; sprinkle over casserole. Bake for 20 to 30 minutes until the top browns and casserole are bubbly.